About Wooden Belfries – Standing close to the church or separate wooden belfries (bell towers) are characteristic buildings of the Carpathian basin. Their structure and form may vary by region. The three regions where they can be found in abundance are: South-West Transdanubia (HU, SI, AT), Upper-Tisza Region (HU, UA) and in Transylvania (RO).Although these bell towers canbe found in churches of different denominations, this building type is closely connected with the history of Hungarian Reformation. The Catholic Habsburgs who ruled Hungary in 17th Century restricted church building by Protestants until 1781: they did not allow churches to built with a tower, only allowed timber to be used as building materials and even forbade the use of iron connecting elements (Decree of Posonium, 1681). Under these constraints the timber bell towers were developed as masterpieces of carpentry. By preserving the medieval, Gothic traditions they have become lasting symbols of Hungarian Calvinism (Reformed denomination). Upper Tisza Region – In the time of building Szatmár county formed the borderland between the remains of the Hungarian Kingdom and Transylvania. By the end of the 17th century the Habsburgs finally united all parts of former Hungarian Kingdom under their own rule by expelling the Turks from the middle part of the country and reannexing Transylvania. As result of this, a strong, mostly Protestant, squirearchy evolved here and promoted Hungarian sovereignity from the Habsburg Empire. The isolated world of wetlands and moorlands surrounding the Tisza river helped to preserve the distinctive culture and vernacular architecture which disappeared in other regions. The extensive use of timber in both domestic dwellings and in agricultural buildings was very typical, as was the use of thatched and shingled roofs. History – Belfry of Nemesborzova was originally built in 1667 supposedly by Transylvanian (Sekler) carpenters next to the timber-framed, towerless, village church. The belfry was totally renovated in 1895 when the tower was boarded and the bottom part fenced off. In 1970 the tower was dismantled and reassembled at the Szentendre Open Air Museum in 1973, where it was restituted to the original shingle elevation. The re-erected tower became an iconic symbol of the Open-Air Museum standing next to the church of Mánd, and forms a key element in the recreation of a village from the Upper Tisza Region. In 2001 a copy of the original tower was built beside the Nemesborzova village church in its original location, based on the on original 18th century design. Construction and Form – The structure of the bell tower is more than 21 metres high and is supported by an oak timber frame structure. Nine posts are propped by horizontal beams and transverse braces which are fixed into a network of trimmed beams. The gallery is a separate structure. The timber elements of the bell tower are joined with hundreds of wooden pegs. The cladding is made from pine shingles, which have to be replaced every 20-30 years. The belfry has four pinnacles on the corners of the central, eight-faced spire. The four turreted towers, together with the main and central element of the roof, are often described as one of the symbols of Protestantism referring to Jesus and the four Evangelists: Matthew, Mark, Luke and John. The actual origin of this tower structure comes from the Transylvanian architectural traditions introduced by Medieval Saxon carpenters some centuries before the appearance of Protestantism. 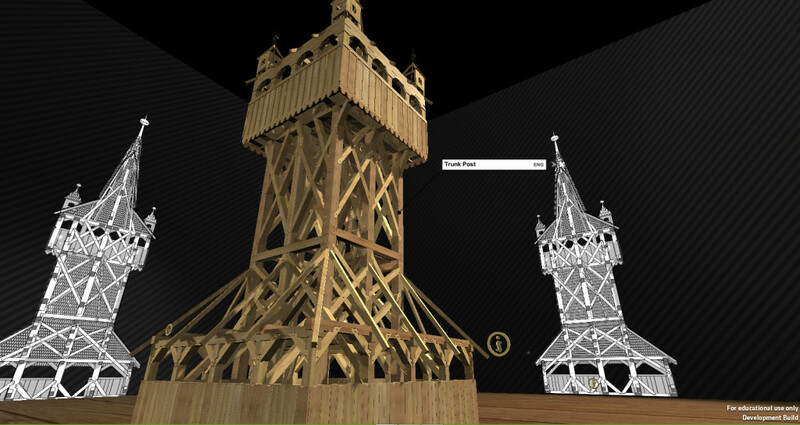 Assembly of the Tower – The timber belfry comprises 3 elements of posts, connecting beams and diagonal braces which together create a strong and stable structure. The use of 9 posts allows the creation of 6 supporting frames, where all the vertical posts become part of two perpendicular frame systems. The assembly of the structure started with the creation of a grid forming the lower sills, then continued with the cutting out’ of the frames. Frames were initially prepared with the perpendicular beams and transversal braces in ust one direction (1st-3rd frames), and the interlocking joints were carefully referenced using carpentry marks, using the same symbols on adjoining parts of the joints to identify all the elements of the structure. When marking the first 3 frames, the carpenters used symbols I to VI, A to K and A to O marks. Then the frames which were assembled horizontally (on the ground) were disassembled and the frames were ‘cut out’ and assembled from the other direction as well (4th-6th frames) using the carpentry marks D to Y, XIII to XII and X to XXI. After this the frames were dismantled again and by referring to the carpenty marks the tower was re-assembled in sequence in to the grid of lower sills on the ground. Similarly, each of the elements of the gallery and the relevant joints were cut out from two directions, then on the top they were assembled together. After this the roof rafters and cladding using shingles completed the structure. Pinned Half-Lapped Joint is used to join timber elements with same or different widths, where either the narrower element, or both, are partially cut to half of the full depth. The joint is strengthened by use of wooden pegs into holes drilled through both the timbers to lock the joint. The creation of the timber joint is usually performed on a horizontal surface (in the rotated state). The two pieces of timber are laid on each other at the required angle, then the cutting lines for the joint are drawn on to the other elements. The perpendicular reference for cutting joints is provided by a plumb-line. Intersections at the meeting points of the diagonal Andrew’s cross braces with each other or other elements (pillar, beam) in an intermediate situation. Horizontal beams in the timber grid are also connected this way, except that those connections are not pegged. Pinned Dovetail Joints are typically used to lock connection at the ends of the knees and Andrew’s cross braces where they join the posts. These are also held together by timber pegs. Creation of these joints is performed the following way: the timbers that make up the joint are placed upon each other: The part of the brace over the meeting point with the beam or post is cut to length. Then the shape of the dovetail is drawn on the end of the brace. Having cut this out, the form is then copied on the load-bearing element and the negative shape is also cut out equal depth. A hole for the wooden peg is drilled through the joint so this can be used for locking the joint in the final assembly. Tools used for the construction of these timber joints: Plumb line, cross-cut saw, chisel, hammer. Mortice and Tenon Joints – Typically used at the end of the posts, where they are connected to the beams. The tenon is cut out from the length of the post and gets inserted into to the mortice prepared in advance in the beam. This joint is created in the following way: The planned sizes of the tenon are marked on the receiving side of the post, and on the beam. Using a ‘tenon saw’ the unnecessary parts are removed to form a stub. The final size of the tenon stub are drawn (copied) on to the timber for the receiving mortice hole. This is then cut out using a ‘mortice chisel’.